G.P. Putnam's Sons. MASS MARKET PAPERBACK. 0515106402 . New. G.P. Putnam's Sons. MASS MARKET PAPERBACK. 0515106402 Remainder mark . Fine. Bdd Promotional Book Co, 1992-09-01. Hardcover. Used:Good. 2014-07-05. New. Ships with Tracking Number! INTERNATIONAL WORLDWIDE Shipping available. Buy with confidence, excellent customer service! 1991-06-08. New. Ships with Tracking Number! INTERNATIONAL WORLDWIDE Shipping available. Buy with confidence, excellent customer service! E Rutherford, New Jersey, U.S.A.: Putnam Pub Group, 1991 Signed by author with inscription to previous owner on title page. 414 pp. Light corner and edgewear with slight give in hinge. Griffin signed with heavy black felt tip pen which left a few small spots on associated page. Clean interior. Dust jacket is bright with light edgewear and a little rubbing shows on glossy finish of rear panel which also has remains of label. Nice signed copy.. Signed by Author. First Edition. Hard Cover. Very Good+/Very Good. 8vo - over 7¾" - 9¾" tall. Putnam Adult. Hardcover. 0399135502 New Condition. . New. Putnam Adult, 1991-01-16. Hardcover. New. Excellent condition. Interior is tight, bright and clean; no underlining, notes or highlighting. Hard covers are tight and stiff. Complete with original and sticker free paper dust cover. Minor scuffing and/or wrinkles on the paper dust cover. 100% Satisfaction Guaranteed. All items are carefully enclosed with bubble wrap. We ship promptly and worldwide via US Post and will email you a tracking number. 1991-06-08. Good. Ships with Tracking Number! INTERNATIONAL WORLDWIDE Shipping available. May not contain Access Codes or Supplements. May be ex-library. Shipping & Handling by region. Buy with confidence, excellent customer service! New York: Putnam. 1991. First Edition. Very fine in dust jacket. .
Bdd Promotional Book Co, 1992-09. Hardcover. Good. Putnam Adult, 1991-01-16. Hardcover. Used:Good. 1991-09-07. Good. Ships with Tracking Number! INTERNATIONAL WORLDWIDE Shipping available. May not contain Access Codes or Supplements. May be ex-library. Shipping & Handling by region. Buy with confidence, excellent customer service! Putnam Adult. Hardcover. 0399135502 Like New Condition. . Fine. Bdd Promotional Book Co. Used - Good. Ships from the UK. Former Library book. Shows some signs of wear, and may have some markings on the inside. 100% Money Back Guarantee. Your purchase also supports literacy charities. NY: Audioworks/Simon & Schuster, 1991. Audio Book. VERY GOOD. 2-tape Audio Book. Slipcase has worn corners. Running time: @ 3 hours. Read by: Gerald McRaney. "Guadalcanal...daredevil pilot, Charles Galloway...infantry combat commander, Jack 'No Middle Initial' Stecker...ex-Marine Fleming Pickering..." ISBN: 0671730053. USA,NY.PUTNAM,1991.US,8vo HB+dw/dj,1st edn.FINE/FINE.No owner inscrptn,no price-clip to dw/dj.Continuing series about the USMC,WW2 in the Pacific - Midway and Guadalcanal. G.P. Putnam's Sons, 1991. Paperback. New. 6.8 x 4.3 cm. U.S.A.: brilliance Audio, 2013. Audio Book. Good. preloaded_digital_audio_player. PLAYAWAY ** DIGITAL AUDIO PLAYAWAY EDITION ** withdrawn from the library collection. A PLAYAWAY is a Compact Digital Audio Player already pre-loaded with your audio book. PLAYAWAY IS EASY TO USE! Just plug in the earphones, press the power button ON and begin to listen and enjoy. Included is a NEW BATTERY and NEW EARBUDS. Light weight with a powerful purpose. Take along on your next journey. Makes a sensitive get well gift! Enjoy the convenience and versatility of the PLAYAWAY for all your travel and leisure needs. .
E Rutherford, New Jersey, U.S.A.: Putnam Pub Group, 1991. First Edition . Hardcover. Fine/Fine. 8vo - over 7¾" - 9¾" tall. Fine blue quarter-cloth over red boards. Fine red blue color pictorial DJ. (1991), 8vo, 414pp. 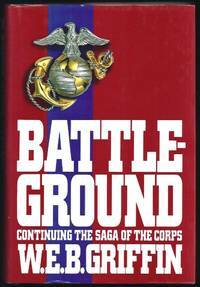 "Battleground Book IV continues the saga of The Corps with the story of one of the epic conflicts of the Pacific, the bloody months spanning Midway and Guadalcanal..."
NY: G. P. Putnam's Sons, 1991 Book. Very Good. Soft cover. Uncorrected Proof. Uncorrected Proof of this best-selling saga of The Corps and the epic struggle for Guadalcanal during World War II..
NEW YORK: G. P. PUTNAM'S SONS. VG/VG PAGES CLEAN, BINDING TIGHT. Pages: 414. . 1991. 1ST PRINTING. HARDCOVER.. Condition: VG/VG PAGES CLEAN, BINDING TIGHT. Pages: 414. NEW YORK: G. P. PUTNAM'S SONS. VG/VG- DJ SPINE LIGHTLY SUNNED. Pages: 414. . 1991. 1ST. HARDCOVER.. Condition: VG/VG- DJ SPINE LIGHTLY SUNNED. Pages: 414. New York:: Putnam,, 1991.. NF/NF (edges of textblock slightly soiled.). First printing. Book IV in the sage of the Marine Corps - the story of the battles of Midway and Guadalcanal in the Pacific during WWII. New York: G.P. Putnams Sons, 1991. 414 pages. Book and Jacket are both in Very good condition throughout. Daredevil Pilot Charles Galloway Takes Command Of A Fighter Squadron And Finds His Mettle Severely Tested.. First Edition. Hard Cover. Very Good/Very Good. Jove, 1991-09-01. Mass Market Paperback. Used:Good. Putnam Pub Group. Literature & Fiction. New. The Corps Brand New: This item is brand new unopened, never used and still in its original manufacturer condition. Putnam Adult. Hardcover. 0399135502 First Edition/ First Printing. Hardcover with Dust Jacket. Book: Boards with shelf wear. Pages unmarked. Binding with no separations. DJ with edge wear. no tears **Tracking on all US orders. Most orders shipped within 24 hours. International customers will be reimbursed a portion of unused shipping charges.*** . Very Good. G.P. Putnam's Sons, New York, 1991 ISBN# 0-399-13550-2 First Edition, #4 of the Corps series. vg/vg, Dj lightly worn on edges. Light rubbing on back cover. Book has bending on spine edges otherwise near new. 414 pages. Now protected by mylar cover.. F. Hardcover. G. P. Putnam's Sons. Used; Very Good. Putnam 1991. Hard Cover. Book Condition: Very Good. Jacket Condition: Very Good. First Edition . 1991. First Edition. HARDCOVER. Brilliance Audio, 2012-10-01. Unabridged. Audio CD. Very Good. G. P. Putnam. Very Good in Very Good dust jacket. 1991. Hardcover. B034709; 413 pp hardcover, good contents & dustjacket, some wear & fading . New York, NY, U.S.A.: G.P. Putnam's Sons, 1991. First Edition. Hard Cover. Very Good/Very Good. Brief summary of content available upon request by e-mail. Putnam Adult. Hardcover. 0399135502 . Very Good. 1990. G.P. Putnam's Sons. MASS MARKET PAPERBACK. 0515106402 Special order direct from the distributor . New. New York, New York: G. P. Putnam's Sons, 1991. 1st Edition 1st Printing. Hardcover. Very Good/Very Good. 8vo - over 7¾" - 9¾" tall. First Edition (Number Line With The One Present). No Chips, Tears Or Writing. Light Edge Wear. Four Pages With Corner Creases.